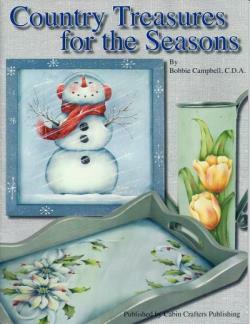 Decorative painting books, Packets, brushes, Surfaces and more! HELLO to all my painting friends and Happy Fall to ya all!! I am a warm weather bird and I know what's coming. So I will enjoy these beautiful fall days for as long as I can. Even though our winters here in East Tennessee are much milder than our Chicago winters, they are still winter with occasional ice and snow. We are out in the country and live in the mountains about 2600 feet elevation - and have a beautiful mountain vista and that first snow fall is absolutely beautiful. But, it can stop there!! If any of you follow Janice Miller from Elizabethton, TN on facebook, she just lives a few hills away and the pictures she takes and posts are just as beautiful in person as they are online. We do love this area. A few more conventions are left this year, which has flown by WAY to fast. 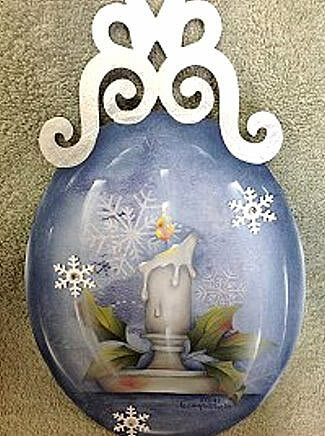 I will be at NET (New England Traditions) Convention and Oklahoma City for the PAINTING PALOOZA Convention in October. I am in the process of designing new packets as well as a new book. I hope to have the book for sale at HOOT in August. “NEW LIFE FOR COUNTRY TREASURES”. 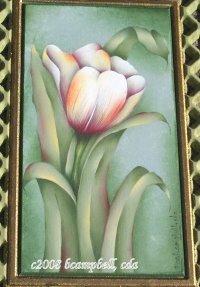 Flea market and garage sale finds that are being given a “new life” with decorative painting. Have only started designing for this book; but, I do have a multitude of collected surfaces to hopefully inspire you to go looking for some of those bargain treasures yourself. Be sure to sign up for my e-mail newsletters, so that you can receive updates on convention classes, seminars, new packets and sales. I will also be posting some of my designs painted on those “finds” before the book is released. With my webmaster's foot still in the middle of my back, (I love her will all my heart) I am still going to try e-packets soon. Trying to teach an “old dog” new tricks here (ha ha); but, times they are a changing. And whether I like it or not, must do a little changing myself. 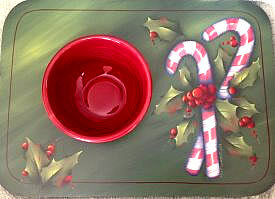 "Having a Sweet Christmas Tray"
notice of new items or website specials. All content of this website is owned by Bobbie Campbell, CDA and Web World Plus and is protected by worldwide copyright laws and products featured on this website are protected by the laws of the United States and those of other countries and jurisdictions around the world. You may print or copy materials published by Bobbie Campbell, CDA on this website for personal, non-commercial use only. You may not copy, reproduce, distribute, display or otherwise use any materials published on this website for public or commercial purposes without the prior express written consent of Bobbie Campbell, CDA and Web World Plus. Materials copied from this website for personal use or with prior written consent must, in any event, retain all copyright and other propriety notices and disclaimers appearing in connection with such materials on this website. 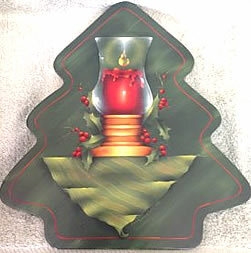 You may paint the designs in my books and pattern packets for personal use and for teaching. However, no part of a book or pattern packet may be reproduced by any means, electronically or mechanically, without the written permission of Bobbie Campbell, CDA or Prudy's Studio, Inc. It is requested that if a design is to be taught to 6 or more students that packets be ordered from Bobbie Campbell, CDA. Books, packets, brushes, video and surfaces can be ordered from this website.